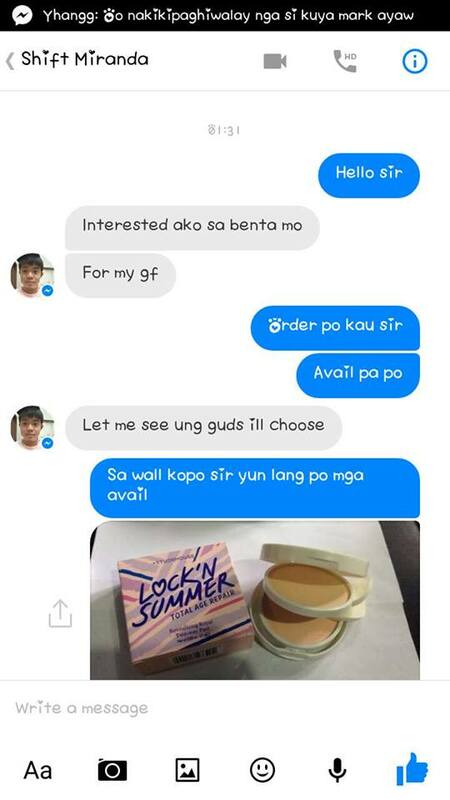 A guy named “Shift Miranda” gave an indecent proposal to an online seller named Anna Dela Cruz. 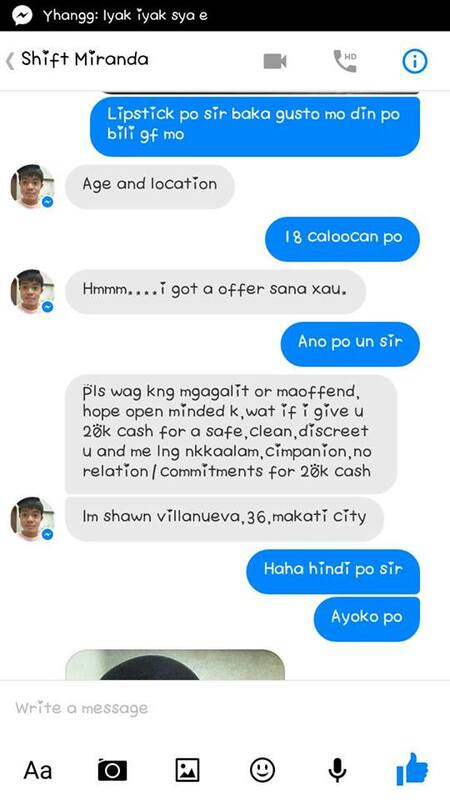 Ms. Dela Cruz posted some screenshots of their conversation in public Facebook group Hachi’s Buy and Sell. Shift Miranda started to inquire about the cosmetics offered by Ms. Dela Cruz via Facebook messenger. He said he is interested to buy some goods for his girlfriend. 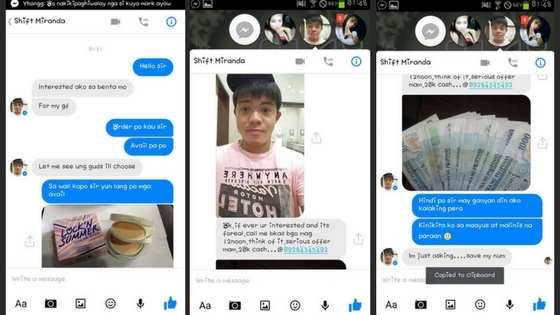 After sending a picture of her product, he started to give an indecent proposal. “Please don’t get offended or mad. I hope you’re a open-minded person. 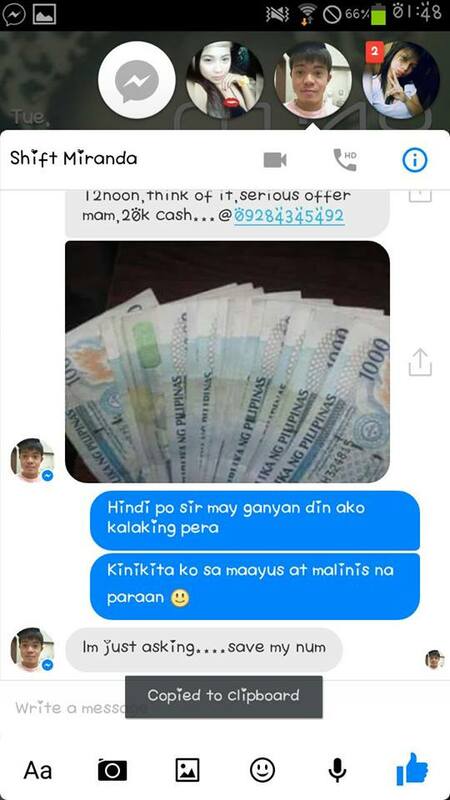 What if I give you P20,000 cash for a safe, clean and discreet companionship. No relationship or commitments for P20,000,” he offered. He even gave out his number, another name and his location. He also sent a picture of the money as a bait. “Mr. Villanueva” seemed serious and he asked Anna to think about his serious offer. He still insisted his offer even Ms. Dela Cruz already declined. Netizens named him “Boy 20k”. The same modus and offer has been doing rounds online for quite sometime now. On the screenshot below, it is from a certain “Shawn Rage”. Be careful who you talk to online. It is very easy to steal pictures and create a new identity. Do you have the same experience? Share your thoughts below.